The Ruth Readford Award for Lifetime Achievement Honours an individual who has dedicated significant energies, time and commitment to improving planning and/or management of the NSW coast. The Selection Criteria is described as: Positive impact of actions of individual either through employment or volunteer effort; length of time involved in coastal issues; and recognition by the broader community of individual’s contribution to coastal management. Councillor Jacqui Townsend, Mayor of Pittwater, nominated long term bush regenerator Marita Macrae for this award which was presented on Thursday November 14th, 2013 at the 22nd NSW Costal Conference, held this year at Port Macquarie. 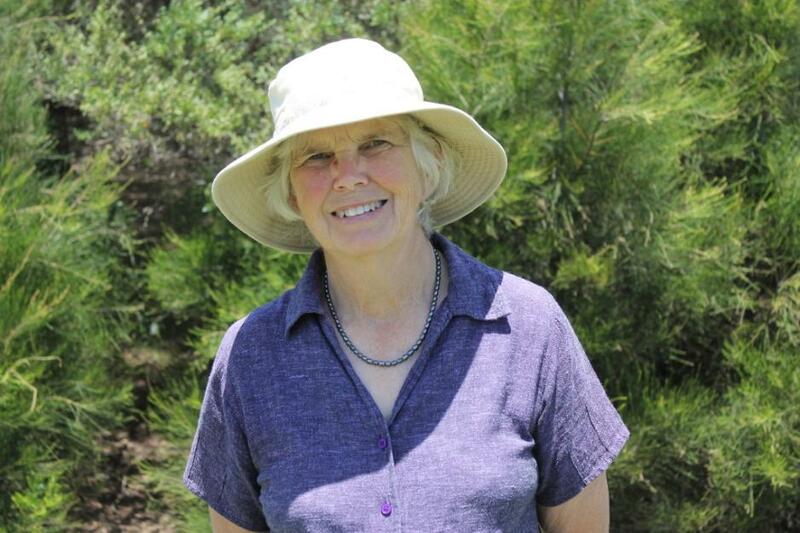 "Unlike many who looked at weed infested bushland, sediment choked creek lines or littered beaches and said “they should do something”, Marita decided that we, as individuals, could do something. Thus began decades of tireless dedication to environmental causes (which continues to this day) with Marita establishing bushcare groups, writing environmental articles and newsletters, applying for funding, participating on council committees and trusts as well as lobbying governments to ensure that the natural heritage of Pittwater receives the recognition and protection it deserves. By taking ownership of environmental problems and devising and implementing practical measures to solve the problems, Marita has, by example, motivated many others within the Pittwater Community to become involved in the conservation of our precious natural resources." We can vouch for a generous sharing of knowledge from Marita - whenever we cannot identify a bird or a plant photographed Marita is quick with an answer and also a query as to where and when we took the picture - a vital aspect of keeping records of and on Pittwater. Another thing first noticed about this lady is her happiness to talk about the work done and to be done but an aversion to speaking about herself. In between morning and afternoon Bushcare work on Thursday Marita kindly met a staffer to discuss a quarter of a century of returning the original environment to Pittwater at the site of her first major project. We’re at Avalon Dunes today talking to Marita Macrae who has just been made the recipient of a Ruth Readford Lifetime Achievement Award. The restoration and maintenance of the Avalon sand dunes has been a long term and quite big project – how did that start? It had various beginnings. I was always interested in gardening and when I had the opportunity to do Horticulture in the late 1980s, part of this was a Bush Regeneration course. While doing this I learnt about Bitou bush. Also, Warringah Council as it was at this time, around 1989, started on the dunes as they were about 80% Bitou. The dunes are divided into paddocks, and you can see tracks between these. Warringah Council started in the one nearest to the surf club. They had a grant and got a tractor in there and pulled out lots and lots of Bitou. They then planted some natives – Coastal teatree, some Beach Spinifex and Coastal Banksias and that was it. The idea of those plants was to stabilise the sand after they’d pulled out the Bitou. Unfortunately Bitou is a terrible seeder, producing thousands and thousands of seedlings. In 1989 I used to watch what was happening. I had a young Labrador, Toby, which I used to take for walks behind dunes and watch the Bitou bush seedlings there. The area to the north was still mostly Bitou. You can’t just start a job like that and walk away from it or the project would be a waste of money. At the beginning of 1990 there two people, myself and a man who left Avalon a couple of years later, approached the Council and suggested we form a volunteer group to maintain what had been started and to continue it. That’s how it really began. What was the name of this volunteer group? We called it Friends of Avalon Dunes Dune-Care Group, which was a bit of a mouthful. But in those days, the early 1990’s, it was part of a lot of work to control Bitou right along the NSW coastline, mainly on dunes, and also in the forests behind dunes. There were lots and lots of groups working at this – mainly north up the coast but also as far down as Tathra on the south coast There were lots of very good volunteer groups working along the coast and we just became one of those. Ruth Readford I met when we got started in the early 1990s soon after we’d got started. I hadn’t known her before but she lived at this time at Ballina. She was a very good leader and organiser. She initiated telephone link ups and Dune Care conferences. We would meet in small groups and talk about our projects. She has written a book about community dune care at Ballina. The restoration works which began in 1990 have an ongoing maintenance though – you have just reformed the group? We were working on the Avalon dunes for about 20 years and during that time we’d had quite a few different grants. The Catchment Management Authority grant in the early 1990’s, a State Government grant, NSW Environment Trust grant and several Coastcare grants. I cannot take credit for receiving those grants. I helped write them but I had a great deal of help from Pittwater Council staff, particularly Paul Hardie. He always worked as a volunteer as well, right from the very start, despite having a young family. Eventually the Council, after our grants projects were completed, took on maintenance and engaged bushcare contractors to work on the dunes. We thought everything was going well – the fact is that Bitou is a very obvious weed and people like to do big obvious weeds; they’re satisfying to do because you can see what you’ve done when the work is done. There are a lot of other weeds there though that benefited from the disappearance of the Bitou, Morning Glory in particular. About a year ago I noticed that the dunes were still looking pretty weedy so I suggested about September 2012 we reform the group. We’ve been working one morning a month ever since. When and where does this group meet? On the first Sunday of each month at 8.30am. We’re only working on a small section at this stage and have been meeting at the back of the dunes near the little bridge over Careel creek. Out major weed that we’ve been tackling is Morning Glory, which we’ve been doing for years. It’s a very time consuming insidious weed. Although the Council still has contractors working here I think this one is best tackled by volunteers who don’t mind doing the fiddly work that you need to do to try and control it. This is not so easy for contractors that need to be able to show where they’ve been working to their employers. If they have a team of six people working a whole day on Morning Glory, you will not be able to see much difference. I think this is a weed better tackled by us volunteers. Many are happy to do this, others would rather find Asparagus Fern, Turkey Rhubarb or Bitou and tackle that. Catchment Management Authorities – you have worked with them on various projects? Yes. The last grant we had from them for working on Avalon dunes was about 1996 or 1997. I worked out a while ago that this must be the section on the NSW Coast that’s had the most money spent on it in terms of grants. Weeds are a threat to the rest of Pittwater’s native vegetation. Asparagus Fern is now recognised as one of the worst weeds in Australia and it’s certainly Pittwater’s worst weed. Through the Pittwater Natural Heritage Association (PNHA) we’ve had three grants just tackling asparagus fern, totalling about $60 000. We’ve also had two grants that are for Pittwater Estuary Care. Part of that is for targeting Asparagus Fern at Barrenjoey Dunes and also on the Western Shores of Pittwater. This has also been funding for restoration of native vegetation along the banks at Careel Creek and for restoring areas of saltmarsh around Careel Bay. There is also the big project at Ingleside that you have been a part of through the Pittwater Environmental Foundation? We were lucky enough to get a Large Project Grant, as it was called, from the NSW Environmental Trust for a restoration project in 2012. This is a six years project, funded by $250 000, which is great because you can really plan your work and keep at it for over six years. And match it so what you’re planting is put in the ground at the optimum time for each species rather than pushing to get everything done before a grant expires, which may not suit some species? Yes. It’s a very efficient use of the money, you can see how you’re progressing and instead of most grants, which after a year or eighteen months just stop, in this case we’ll really make some good headway. Your association with Warriewood goes back a lot further than that though? That’s true. Again through Pittwater Natural Heritage Association in about 2004 we got a grant to fund some bush regeneration in the Warriewood wetlands. This also funded community education and that’s how we started doing Breakfast with the Birds. These now happen several times a year and we get people, particularly beginners, to come bird-watching. We’d meet at Katoa Close and go into the wetlands and show people the birds and we’ve kept on going with that. This grant included funds for a modest field guide about the birds of that area. However, very strong people in the community, one of whom was Jim Revitt, and Councillor David James, were instrumental in persuading the son of the former owner of the wetlands, Henry Roth, to help us fund a much nicer Field Guide with colour photos and publish a much more attractive publication. It was a huge success and we still have copies available for those who want one. The Zoomobile was part of another project of the Pittwater Environmental Foundation. This was bush regeneration in Pittwater Spotted Gum Forest on a part of McCarr’s creek called Botham Beach, just along the shore from Homeport Marina. It’s almost an invisible site as it’s on a slope between houses and the shore, but has beautiful spotted gums and grey gums. Part of that project involved putting up boxes for squirrel gliders because they need holes in old trees to survive, and these are in short supply. After putting up the glider boxes we thought it would be good to help the community become aware of what we were trying to do and we thought of Loquat Valley School, surrounded by Spotted Gums. The grant funded the Zoomobile visit to the school with a Sugar Glider to show one of the classes. That was a great success because the teacher there, Beth Glyde, taught the class about gliders and their conservation, incorporating art, music and teaching positive environmental messages. Beth has done this again this year, 2013, with her subsequent class, so this has had a long term benefit. Having done over 20 years of work in the restoration of our environment – what are your favourite projects from those times? I can’t think of a favourite. Another one I was involved in during the 1990s, but which has now stopped, was Palmgrove Park, in Avalon. We had another group of volunteers there. We got two Coastcare grants for that which enabled contract bush regenerators to work there. Unfortunately we volunteers got a bit overwhelmed after 10 years and the regeneration never was really completed. There’s so much bushland in Pittwater that it is more than the Council can properly manage with all the skill and will but limited funds. It is hard to get grants that will fund maintenance, rather than a new project. That’s why it’s vital to have volunteer bush groups? Yes. And it’s very helpful to have volunteers working alongside contractors who are funded by a grant. It’s very encouraging for the volunteers. That’s what happened in Palmgrove Park for quite a few years. The enjoyable bushcare projects are ones where you can continue and see the results. People think ‘I’ll just do some bush regeneration this weekend'. Then something gets in the way and they don’t come back, and they think, “oh, the weeds have come back, it’s all a waste of time”. You know what your aims are and to stick at it over a year or even longer to see the results. Before and After photos are amazingly encouraging. Not only are you getting rid of weeds, you’re getting back native habitat for birds and animals – you will feel good about that when you see the birds come back. What do you think is the greatest danger to our coastal environment – pollution, rubbish people leave in their wake, apathy about weeds? I think there is a lot of apathy about weeds and a lack of recognition of them. In the more suburban parts of Pittwater we’d like to see more people have a bit of bush or suitable habitat on their land – many people do have land that is big enough to keep a bit of bush as natural bushland, particularly in the northern part of Pittwater. That would then be habitat for wrens, lizards etc. Do you think we need more wildlife corridors – our koalas are gone because these disappeared? There still are wildlife corridors but these need to be saved from too much development. With the koalas it’s not so much that the corridors are gone, but that there were other contributing factors – including fences, swimming pools, dogs in backyards, fences they couldn’t get over and also a lack of suitable trees. They needed a variety of eucalypts to feed on at different times of the year. When I was working as a paid contractor in Angophora Reserve we saw a lot of the grey gums had died off. Whether they were more affected by urban drainage coming from the slopes above the reserve, extra nutrients coming from the soil and runoff of gardens and whether grey gums were more sensitive then other eucalypts, I don’t know, but they were a major food tree for the koalas. You do also have to have, as you said, those corridors so they can get from one set of food trees to the other – we originally had some of these in Avalon between Angophora Reserve, Stapleton Park and on Bangalley headland. Some people say that the construction of Pittwater Palms retirement village was a bit of a fatal blow for the koalas that needed to be able to move between those reserves. They were supposed to plant a lot of swamp mahoganies, which was a favourite eucalypt. People used to complain about the noise of koalas at night during the 1970’s – not anymore. Marita, I know you say you’re going to be in a wheelchair pulling up weeds, but you may want to retire one day – what can other people do if they want to get involved and take Pittwater’s environment forward as it is now for another 20 plus years? Well, I know ticks are a bit of a turn off, but I worked on Mona Vale dunes all this morning and someone saw one walking on my shirt and pulled it off, only one. Some people have good cause to be concerned about being bitten by these but there are products you can put on before starting any bush work. Really, it’s a wonderful thing for the newly retired to do. If you’ve just finished work, you may be 65 or 70, you still have lots of energy and years ahead of you and it’s a very satisfying thing to take up. Socially there are very nice people to be with, you keep fairly fit, and you can see the results if you stick at it. People can often show you pictures of what it was like before the group started. It’s also not that much time each month – most of the groups meet for a few hours once a month, on a weekend or a week day. When I started on Avalon Dunes in 1990 the general approach to managing dunes then was very similar to an engineering one. I had two aims, partly because I’d done Bush Regeneration training at TAFE. So our aims were twofold; one was to reinstate the original vegetation on the different areas of the dunes and to do that as a way to prevent the sand blowing away. That was a bit unusual at the time, when stabilisation was top priority and ecosystems came last. I can remember going up to a dune care conference where someone had collected a whole bucket of wattle seed from somewhere up and down the coast, they weren’t too sure where, whereas from a bush regeneration point of view that wasn’t such a good idea as A; you’re planting too much of the same species, and B; you’re supposed to know where your seed has come from and try to get it locally so you’re not mucking up the genes of the plants in your local area. And thus undermining what makes each place unique or special? Yes. I visited dunes from Collaroy to Palm Beach to find dune plants that could be on Avalon Dunes, and planted these. When we first started trying to make our way through the bitou, it was so thick you couldn’t walk through or in there, there weren’t many birds to be seen. Some time later we had quite a list of bird species living there. The reason for this is bitou doesn’t have many insects but native plants do. So we had spiders, which is a good sign that means there’s also insects there as well, and these brought in all the little the insect eating birds that people love, like blue wrens – they find it a really good habitat. It’s thriving with birds now – we’ve photographed blue wrens, two species of honeyeaters, thornbills – it’s noisy with birdsong in there, lovely. During two decades of working in bush regeneration – have you seen any advancements or evolvements in this field? The education and techniques of bush regeneration has of course advanced but I haven’t been involved with that. I’m a member of the Australian Association of Bush Regenerators, which is an extremely good professional association. They have two major branches – one is the promotion of Bush Regeneration as a profession and their other benefit is to spread information about techniques. They’re extremely good at that and I really value their monthly newsletters. So things are definitely developing. Pittwater Online lists the monthly Bush Care Notices on our Community News page. How else can people keep themselves of local bush care volunteer groups? Sign up to receive Pittwater Council’s Cooee – that lists them all as well as other environment activities. You can also ask the council what bush care is done near where you live; if we don’t look after our own territory nobody else will. If you live somewhere near a bushland reserve there might be a bushcare group working there already. Approach the council about when they meet and join them and start that way. If you see a bit of bushland that you really love and can see it’s weedy it might be an idea to contact the Council to see if they will help you start a bushcare group. If you can get four or five people they will pay for a supervisor to help you. It may look easy to just go in there and get rid of these weeds but you really need a professional person to guide you; to identify the weeds, to show you the techniques, to give you a plan of action, so you are working systemically. If you do it properly you will see lasting benefits rather then get frustrated and disappointed. So if people make a commitment to put in a few hours once a month they will see long term restoration of Pittwater? Or every second month - you don’t have to go every month but it is worth letting family or friends know that every third Wednesday or Saturday of the month is your bushcare group day and that that is your time for doing that and that you have committed to doing that. Some of us have an excellent morning or afternoon tea with fantastic cake. It’s not all hard work, it’s a lot of fun and the people are nice – you get to share ideas with them, about how to manage their own gardens, recognising weeds and learn about native plants, insects, birds and so on. Many people have contributed to the projects I’ve been involved with. Particularly: Paul Hardie, on Pittwater Council staff and a volunteer for 22 years. Without him probably Avalon Dunes would not have been the successful project that it became, and also Karin Nippard, Bushland Management Officer at Pittwater Council. Also many volunteers. 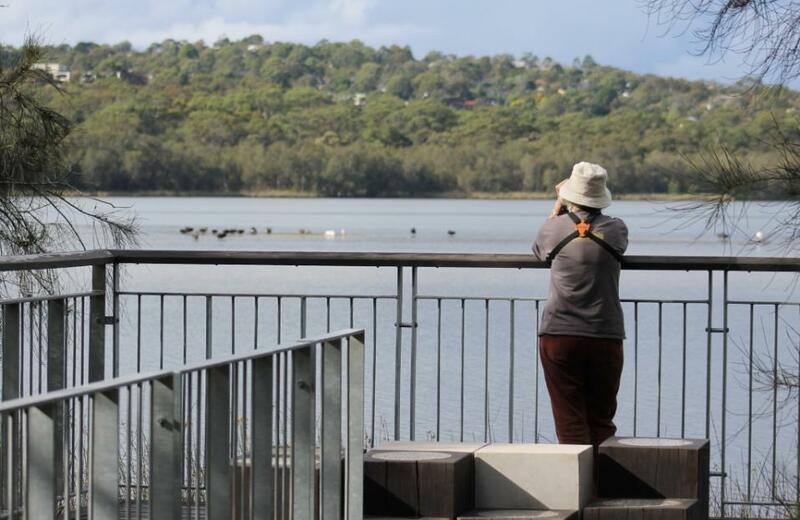 Marita, watching the Black Swans who returned to Narrabeen Lagoon this year. Pictures by A J Guesdon, 2012- 2013.